This week we’re focusing on teaching Indonesian gamelan. 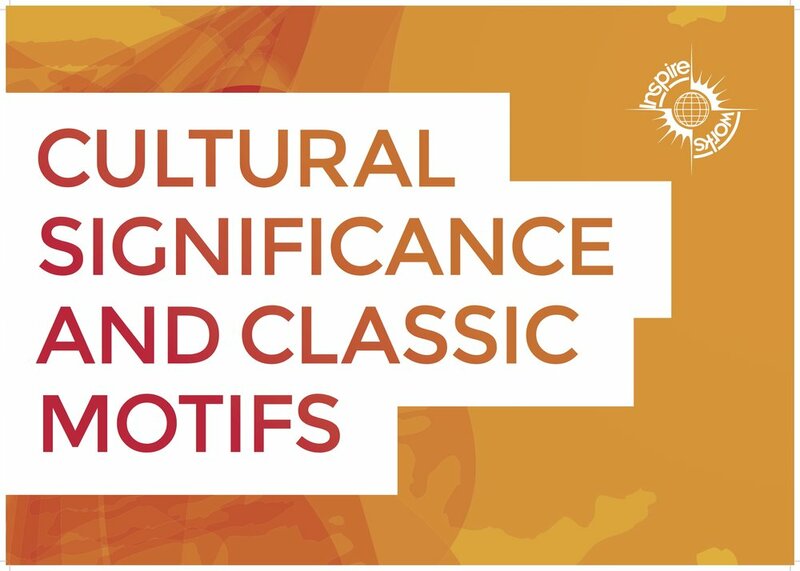 The previous two blogs have focused on Brazilian samba drumming and West African drumming. Classroom glockenspiels or xylophones will be sufficient replacements for most gamelan instruments. Use notes A, C, D, E & G for the Slendro scale (used commonly in Java and only for shadow puppetry in Bali). Use notes E, F, G, B, C for the Selisir scale which derives from the 7-tone Pelog parent scale (most commonly used in Bali in the Gong Kebyar ensembles). Gamelan music is heterophonic; the balungan (core melody) is always an eight note (or multiple of eight notes) melody and is played at alto range, usually as a constant crotchet melody cycle. Soprano instruments decorate the balungan by playing each note twice (i.e. quavers), tenor instruments play every other note of balungan (i.e. minims) and bass instruments play one in every four notes (i.e. minims). Rhythmic decoration is then added by the reyong pot gongs (known as a bonang in Java), cymbals and drums. The largest gong always plays on the last beat of the cycle and other gongs punctuate the melody by playing once or twice in the cycle. The gangsa/saron (metallophone) damping technique is the most challenging technique in gamelan. The student should pinch the edge of the last note with their thumb and forefinger whilst playing the next note with their hammer. It is quite typical in a Key Stage 2 or Key Stage 3 lesson for the students to find this a coordination challenge and leave their hammers stuck to each note which would of course produce a harsh and poor sound. The Reyong/Bonang kotekan (decoration) is also tricky to play due to the interlocking rhythmic parts. The 3-stage teaching method is very useful to ensure the students are playing the rhythms correctly on the instrument, especially as the polos (on-beat decoration) players sit in between sangsih (off-beat decoration) players which can be very distracting! Even if you are using classroom instruments as your gamelan, it is important to observe the Indonesian custom of removing shoes to show respect to the instruments, being careful to not step over any instruments. Like West African drumming, most pieces of gamelan music are used for a specific purpose in a specific ceremony (e.g. a tooth filing ceremony to celebrate the coming of age, a funeral march or for a particular scene in a shadow puppet play). A piece we frequently teach in gamelan workshops, the Baris Warrior Dance, is usually performed by a boy aged between 8-14 years old who leads the performance. The kendang drummer must watch the Baris dancer closely to notice the visual dance cues (such as the glance of an eye or flick of the fingers) in order to play the correct rhythmic cues on his drum which in turn inform the gamelan musicians to change the tempo, dynamics, play an angsel (short break phrase) or play an entirely new tune. A balungan (core melody), played usually on the ugal metallophone, is either an 8-note or multiple of 8-notes melody. The strongest beat of the cycle is always the last beat of the cycle. A piece would therefore start on the last beat and end on the last beat and should be counted as “8 1 2 3 4 5 6 7” with the largest gong always playing on the last beat (beat 8). We advise setting up the gamelan instruments so the students are facing you. This is actually the common layout for a Balinese gamelan but may need some careful thought for a Javanese gamelan, particularly if some students are playing multiple hanging gongs. 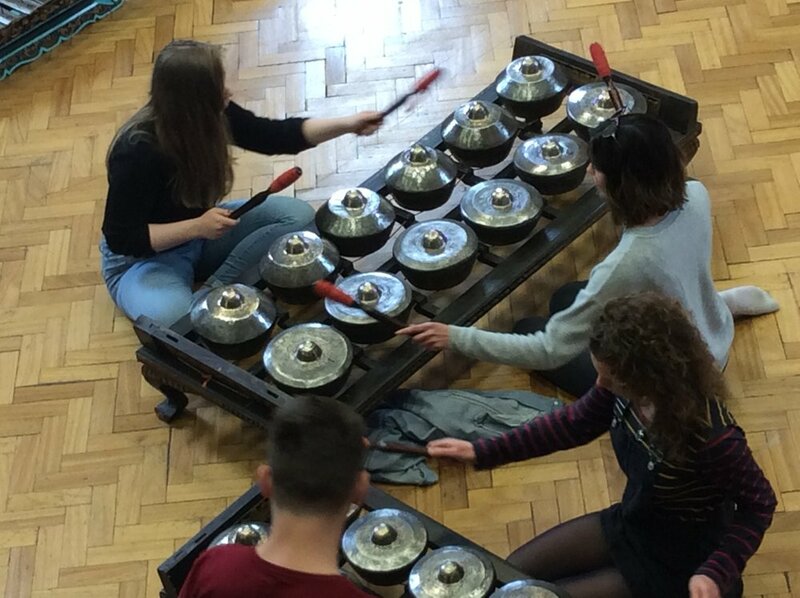 Our gamelan facilitators always play both the kempli (pulse-keeping gong) and the kendang (drum) to ensure the ensemble is rhythmically in time and also can respond to the aural cues from the drum.